GRIFEX was launched, along with FIREBIRD-2, ExoCube and NASA’s SMAP, on Saturday, January 31 14:22 UTC on a Delta 2 rocket from the Vandenberg Air Force Base. 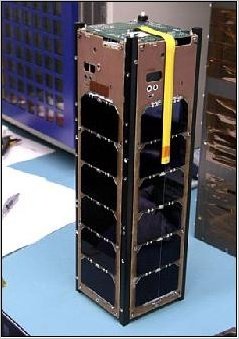 The GEO-CAPE ROIC In-Flight Performance Experiment (GRIFEX) is a 3U CubeSat developed by MXL that will perform engineering assessment of a JPL-developed all digital in-pixel high frame rate Read-Out Integrated Circuit (ROIC). Its high throughput capacity will enable the proposed Geostationary Coastal and Air Pollution Events (GEO-CAPE) mission concept to make hourly high spatial and spectral resolution measurements of rapidly changing atmospheric chemistry and pollution with the Panchromatic Fourier Transform Spectrometer (PanFTS) instrument in development. GRIFEX is the fifth satellite developed by the MXL research and student team.